One2Automate is an innovative-effective automation framework with a rich set of features for functional automation testing. It supports Web, Desktop, Mobile and client-server applications. With One2Automation, the effective automation testing solution is offered by MeU Solutions. 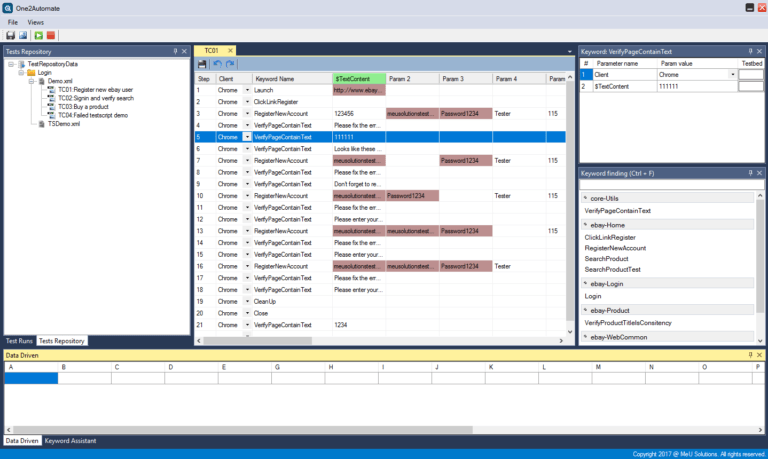 Through One2Automate’s intuitive GUI, QA Engineers who have no programming languages can quickly create and perform automation testing, freeing up more cycles for human-based testing. This framework is a MeU Solutions’ IP. It was developed by a group of experienced developers and automation solution specialists. This framework is one of three critical elements of a complete testing solution. According to MeU Solutions, a perfect solution is a wise combination of “People, Methodology, and Tool”. customized easily against client’s needs. Want to check out our innovative-effective automation testing solution with the right engagement model, and for the full effective automation testing solution, you can visit MeU Solutions website or contact us for detail.